They say one man’s trash is another man’s treasure. For local Southern Arizona artist Taylor Graves, that old saying could not be truer. With the right materials and a little imagination, a “piece of junk” becomes a work of art. Let’s get to know a bit more about one of Bookmans’ most popular local artists. Taylor Grave’s hobby is creating original, wearable art from what one might assume is just junk. You may know it by another name, upcycling. Upcycling is the process of converting old or discarded materials into something completely different. Graves works with a variety of different materials including cigar boxes, vinyl records, vintage toys, wine corks, old car parts, bottle caps, and books. He then turns them into guitar picks, jewelry, drums, guitar pick guards, and so much more. Another of Taylor’s passions is music, and he’s a working musician currently touring throughout Arizona. He is also in the process of recording a collection of original songs. Amazingly, Graves puts his two passions together, using old cigar boxes and turning them into acoustic and electric-based drums. You can learn more about his merchandise by visiting his online stores Up From Bones and Roze Grave. Bookmans knows the importance of supporting local businesses and local artists. That’s why we carry his and other local artists’ original merchandise in our stores. Bookmans East just got in some of Graves’ gorgeous earrings made from an assortment of different materials. Here are some examples of the beautiful art Taylor Graves creates. Better still, it’s all available for purchase at Bookmans East! 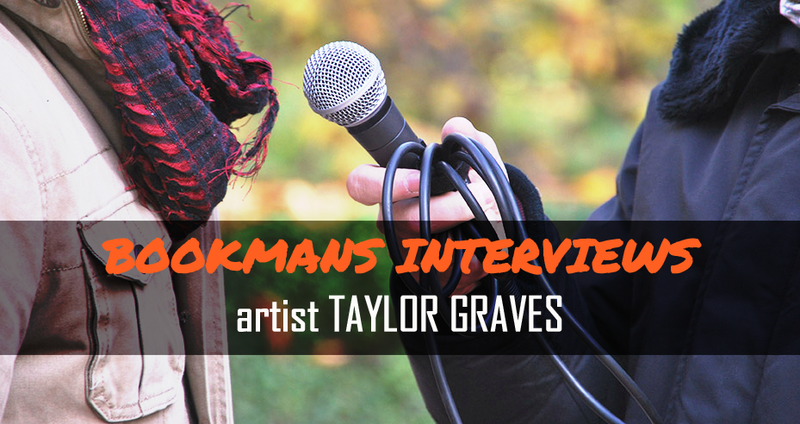 Our thanks to Taylor Graves for this interview! Thanks. And thanks for stopping by!